Anyone close to a TV or Radio knows by now that President Trump fired FBI Comey Director around dinner time on Tuesday. What the letters below indicate, especially the one from the Deputy AG Rod Rosenstein, is that he was fired because of the way he handled the Hillary Clinton investigation, opining that he couldn’t defend Comey’s handling of the investigation into Hillary Clinton’s emails. In actuality Comey deserved to be fired, he was unqualified to hold the office of FBI director—most beltway politicians would agree with that statement twenty-four hours ago. And while the Democrats will say the FBI director was fired to stop the Russia investigation, that is a ridiculous suggestion as the people who may be investigating the possible Trump Team/Russia collusion are still secure in their jobs. As for the new calls for an special prosecutor, it’s doubtful that will happen. Along with the fact that it’s not necessary, Deputy AG Rod Rosenstein his direct superior and the person who wrote the letter strongly recommending Comey’s ouster, is the same person would have to appoint the prosecutor. Catherine Herridge of Fox said the timing of the Comey timing was based on the fact that Rosenstein was only recently confirmed. 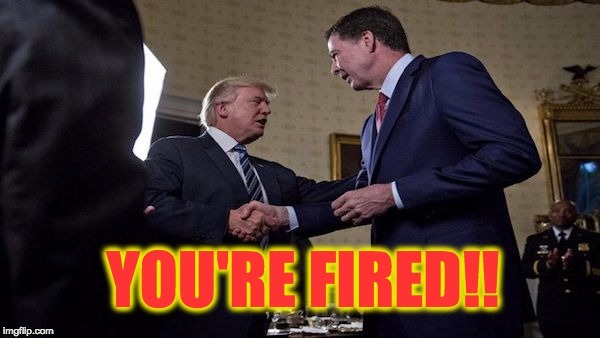 If that was the only reason Comey would have been fired as soon as President Trump was inaugurated. More likely Comey’s recent testimony which many people was both bizarre and narcissistic– he exaggerated the extent of the letters Huma Abedin forwarded to her husband, causing the FBI to send the committee a letter of apology and he refused to say that his moves regarding the Hillary emails were wrong, that testimony may have been the straw that broke the camel’s back. The Democrats of course are having a fit. Many of the same Democrats who called for the resignation of James Comey a few months ago are now saying that Trumps move was horrific, including Chuck Schumer who had said he lost confidence in Comey.